A brushing shampoo based on nonionic surfactants, inorganic acids and fragrances and auxiliaries specially developed for gantry systems and wash lines with industrial water recycling and / or alkaline pre-washing. The surfactants used are readily biodegradable. 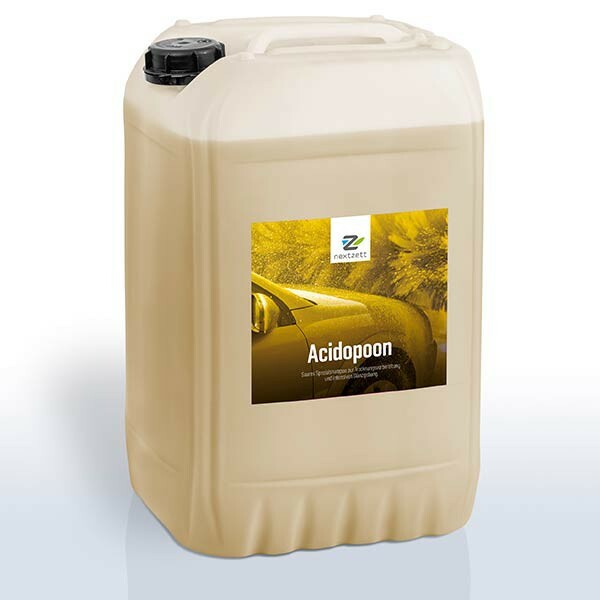 nextzett - Acidopoon is a specially developed for Portal plants and car washes with hot water recycling and / or highly alkaline prewash brush shampoo based on non-ionic surfactants, inorganic acids and odors and adjuvants. The surfactants used are readily biodegradable according to detergent guideline 6ll8 / 200ll. nextzett - Acidopoon convinces with its excellent washing results and extends the service life of the brushes and textile cloth through its self-cleaning effect. Acidopoon is a novel proton donor that provides innovative drying and results in constant drying results without the hassle of adjusting the dosage pumps. nextzett - Acidopoon is easily rinse off bar and gives radiance to any smooth surface . Despite fluctuating quality of service water, excellent drying results can be achieved at any time of the year. As flow agents achieved nextzett - Acidopoon in commercial vehicle washes without fan excellent stain-free results. Application and dosage according to the equipment manufacturer. Optimal effect at a final dilution of 0.15-0.30%. While overdose improves the quality of washing, but the increased use of surfactants makes itself gradually in the deteriorated domestic water quality noticeable.Overdosing as a drainage agent worsens the result.